Scottish artist Neil Irons has been based in London since 1987, moving to his current studio in Walthamstow in 2008. 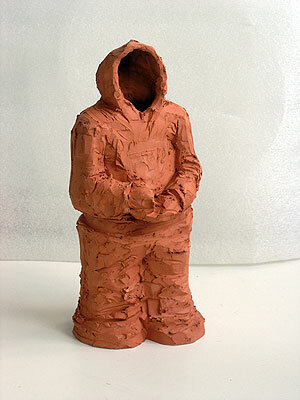 His visual practise incorporates Painting, Sculpture, Ceramics, film and Drawing. Alongside exhibiting his work he has carried out and been shortlisted for many public art commissions and community art projects. This site showcases a selection of Neil's recent paintings reflecting contemporary landscape and media driven imagery, alongside sculpture and ceramic multiples examining our society and the ways in which it is percieved. Neil Irons left his home town of Dundee in 1987 moving to London to start his career as an artist. After studying for his MA at Chelsea he moved around a bit - teaching , doing residencies, living in remote places such as the Cheltenham, Cheptum, Cambridge - that sort of thing - before setting up base in Hackney. He has always worked from a studio and was one of the earliest artists to be priced out of Redchurch Street at a time when it was near derelict. Alongside making and showing his work he started curating exhibitions and ran an artist space for a number of years. Still living in Hackney but finally priced over the great divide of the River Lea as far as workplaces go he now has a studio in the Barbican Arts Group Trust Studios at Blackhorse Lane in Walthamstow. His practise has in the main been a figurative, narrative look at life, love and politics – personal and global. Employing varied media and techniques depending on which method he thinks will best suit the subject he continues to try and understand how we live the way we do and why we do the things we do – he doesn’t make it easy for himself. These days when he’s not in his studio he’s riding a bicycle.